The new Verizon-bound CDMA iPhone showed off at a press event on Tuesday also sports a new build of iOS, with version 4.2.5 featuring a built-in "Personal Hotspot" feature. It remains unknown whether iOS 4.2.5 is exclusive to the CDMA Verizon iPhone, or if Apple will issue an update in the future to bring the Wi-Fi hotspot functionality to current iPhones on other carriers like AT&T. Verizon also did not announce pricing details for the tethering functionality. The new Personal Hotspot feature is found in the native Settings application on the iPhone, sandwiched in between settings for Wi-Fi and Notifications. 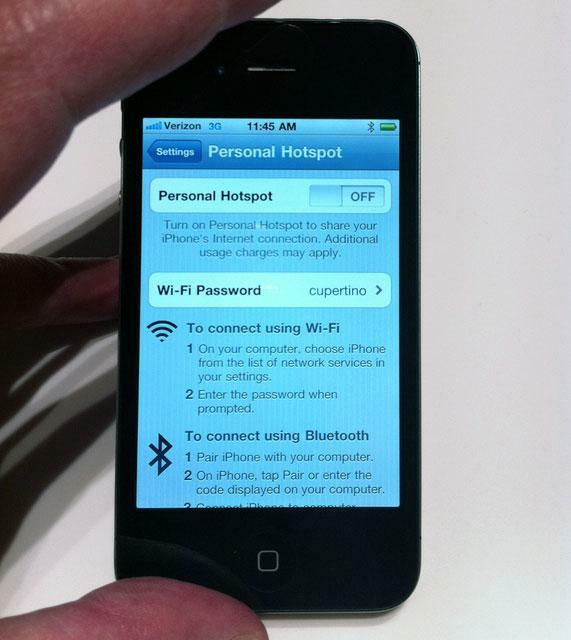 Selecting Personal Hotspot allows users to turn the feature on and share their iPhone's 3G Internet connection via Wi-Fi. It notes that "additional usage charges may apply." Users can also set a custom password for their local Wi-Fi network. Verizon said the iPhone will be able to share its Internet connection with up to five devices. Personal Hotspot also works with Bluetooth, noting that computers can pair with the iPhone via the short-range wireless format to access the 3G Internet connection. Bluetooth connectivity with some devices has been possible in previous versions of iOS, though it is not compatible with the iPad. AT&T customers and others around the globe have had access to tethering on the iPhone for some time, though previously it was only available over USB or Bluetooth. AT&T charges customers $20 per month to allow tethering, while Verizon has not yet announced pricing details. Aside from the Personal Hotspot feature, no new functions or fixes were immediately spotted in the CDMA iPhones demoed at Tuesday's press event. The hardware does include a new internal CDMA radio, as well as a tweaked antenna and frame design that leaked online earlier this month.